Raised in Halifax, Nova Scotia, he has appeared as a soloist and chamber musician across Canada, the US and abroad. A specialist in contemporary music, Paolo is the flutist and co-director of the Nu:BC Collective, a new music and multimedia arts ensemble in residence at the University of British Columbia. To date he has premiered over one-hundred and fifty solo and chamber works, including concerti written for him by Jian-Ping Tang, Dorothy Chang, Aaron Gervais, and Jocelyn Morlock, whose concerto “Ornithomancy”, commissioned with funds from the Canada Council, was premiered by Paolo and the Vancouver Island Symphony in April 2013. In 2016, Paolo released his first solo album, Israfel – music for flute and electronics, on the Redshift label, which includes works by Keith Hamel, Larry Lake, John Oliver, and Kaija Saariaho. The album received two nominations at the 2016 Western Canadian Music Awards, including Artist of the Year. 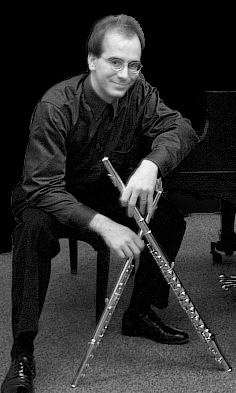 Currently principal flutist with the Vancouver Island Symphony, Paolo has appeared as soloist multiple times with the VIS as well as the Albany (NY) Symphony, the Canada West Chamber Orchestra, and has performed with the Turning Point Ensemble, the Aventa Ensemble, the Vancouver Opera Orchestra, The Vancouver Intercultural Orchestra, as well as the Vancouver and Victoria Symphony Orchestras. He is a featured soloist on Vancouver Visions, a Centredisc release of Stephen Chatman’s music as well as Mirages, a CD of chamber works by Dorothy Chang. In 2014, Beyond Shadows, The Nu:BC Collective’s first CD was released on the Redshift label, featuring music by Dorothy Chang, Marc Mellits, and specially commissioned works by Brian Cherney and Chris Paul Harman. In November, 2014, Paolo performed and recorded Dorothy Chang’s flute concerto “Flight” with the University of British Columbia Symphony under Maestro Jonathan Girard, which will be released on a CD of concerti by University of British Columbia composers. Recent events also included the world premiere of works by Gabriel Dharmoo and Edward Top on Music on Main’s “Modulus”, a performance of Bach’s Brandenburg Concerto #4 on period instruments, performances and clinics in Taipei, Taiwan, a unique arrangement of Mahler’s seminal work “Kindertotenlieder” by Alfredo Santa Ana, the premiere of a new trio by Dorothy Chang, as well as the world premiere of a triple concerto by Aaron Gervais featuring Nu:BC as soloists with the Turning Point Ensemble. A graduate of the University of Ottawa (B.Mus) and the Indiana University School of Music (M.Mus, D.M.A), he serves on the music faculties of the University of British Columbia, where he co-directs the Contemporary Players Ensemble, as well as Kwantlen Polytechnic University and Trinity Western University.